With the release of the Scorpio Milo EX just a week away, I decided to review the original release before my point of view becomes tainted by the experience of Bandai’s latest iteration of this character. Scorpio Milo is one of the Gold Saints of Sanctuary. Although he is a noble champion of Athena, not much is known about his past. 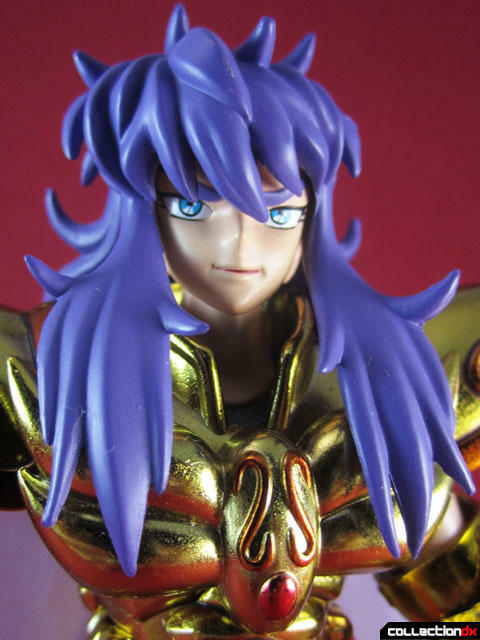 Orgininally the author, Kurumada, had chosen Scorpio Milo to serve as Hyoga’s master. In a last minute change, Kurumada instead choose Camus Aquarius as Hyoga’s Master due to the closer relationship between the ice and water elements of Cygnus and Aquarius, respectively. No longer playing the part of Hyoga’s master, much about Milo was left a mystery. His character is only seen via the conflicts that occur in the series. In the Sanctuary Arc, he squares off against Hyoga, who along with Shiryu and Seiya are trying to pass through his Temple in order to save Athena. During the fight with Milo, Hyoga receives Milo’s signature attack, the painful and deadly Scarlet Needle. This attack injects poison into the victim that causes them to scream in pain, as their body slowly loses all 5 senses and culminates in death, when Milo deals the final attack. Milo pierces Hyoga in 15 points of his body corresponding to the 15 stars of the Scorpio constellation. However, Milo realizes that as he had landed the final strike of the Scarlet Needle, Antares, Hyoga had landed 15 attacks of his own (in the same pattern as the Scarlet Needle) on Milo. Milo admits that his victory is a shallow one, as he won the fight only due to the protection of the Scorpio Cloth. Recognizing Hyoga’s strength, Milo heals the Hyoga’s wounds. Thus allowing the Bronze Saint to continue his journey. Milo does not make another major appearance in the series until the Hades Chapter, when the Specters of Hades are trying to infiltrate Sanctuary to take Athena’s head. During this time, Milo confronts Kanon, the brother of Gemini Saga, who like his brother also betrayed Athena. Although Kanon claims to be a changed man, Milo does not accept that Kanon is now on the side of Athena. Milo decides to deal Kanon punishment fit for a man who betrayed Athena and Sanctuary: death by Scarlet Needle. However, during the process of slowly killing Kanon, Milo comes to accept Kanon motives as true. Milo allows Kanon to live, in a gesture similar to how he spared Hyoga’s life. Milo later joins forces with Aries Mu and Leo Aioria, as they face three Specters with and explosive secret technique. Scorpio Milo comes in the signature Saint Cloth Myth book style box. The Object Mode for Scorpio’s cloth is a scorpion. Surprised? It is neat looking and fairly easy to put together. 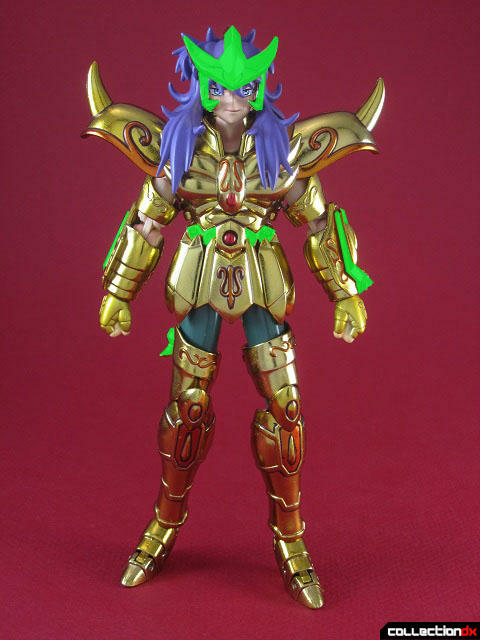 Scorpio Milo, being one of the older releases, uses the first generation Saint Cloth myth bodies. This means less articulation that the later generation bodies, and also a bulkier look. On the positive side, the first generation bodies are sturdy as heck. The Scorpio armor has the sweet scorpion motif thing going, complete with pincers( they snap into the arm guards) and scorpion's-tail headpiece. The neat thing about the tail is that it each link can move individually and is attached to the next link, allowing you to bend the tail. The sucky thing about the tail is that each link can move individually and is attached next link, which means that you can pop each one of these links off if you are not carefully handling it. When I was putting the object mode together, I made the mistake of holding the tail from the middle and applying pressure to it as I tried to insert the tail into the hole in the back of the scorpion body. Next thing I knew, two of the links flew off so fast I had no clue which way they went. Not being able to deal with an incomplete figure, I began tearing apart my room trying to find those two tiny pieces. After pretty much giving up my search, I moved the Object Mode around. Turns out the two links had flown into the side-skirts and were hiding there. This figure also has a huge amount of metal content. Only the headpiece (tail included), the pincers that go on the arm guards and the waist armor are made of plastic. You can barely even see the waist armor, since it is covered by the metal side-skirts. So needless to say, this figure is hefty thanks to the metal content. Bandai made a very detailed armor. This can be either good feature or a flaw or depending on how you look at it, because Bandai took some liberties with the design. These include: the Scorpio symbols on the hands, the orange coloring on some of the armor, and the symbols on the front plate of the skirt armor and arm guards. While aesthetically these changes add depth and detail to the figure, they sacrifice show accuracy in the process. Amidst this beautifully designed armor, there is one glaring cop-out by Bandai: the cape. Although 7 years ago Bandai probably could not have pulled off the sweet three-piece plastic capes that we have now with the EX lines, they could have at least used better cloth for the capes and gotten at least one of the colors of the two-colored cape right. In the show the capes are blue on the inside and white on the outside. Instead we get a light purple cape made out of a thin cloth. 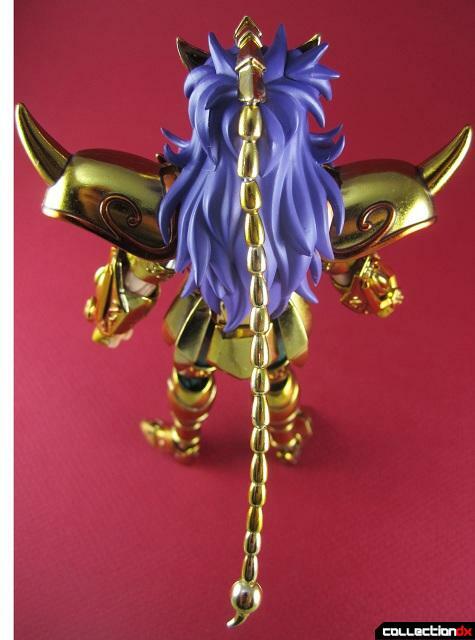 Unfortunately since Milo was an early Saint Cloth Myth Release, he has a big ol’ ugly head; though not the worst offender in the line by any means; Aquarius and Leo still have two of the fugliest faces of the Gold Saints. Luckily Bandai rectified the design mistakes of this figure by releasing an Appendix. The appendix can be displayed a standalone bust. It is also one part of the Athena Exclamation bust set , that requires the Leo and Aries Appendixes to complete. The Appendix trades the metal and the ability transformation between Object and Cloth modes for show accuracy and a slimmer build. The tail of the Appendix's headpiece is a single piece, so there is fear of loosing the segments here! The armor and head from the Appendix can be fitted onto the figure. Bandai even included little extension pieces to link the arms and hands arms to make the arms a little longer. The hands are a bit smaller in size, making them more proportionate to the figure. The appendix also includes a plastic waist armor , which requires the side skirts of the original figure to attach to it .This works better in theory than in execution, since the fit between these two sets is a bit quirky. The tabs on side skirts pop into slots inside of the waist armor. I could not get the left skirt to stay properly in the slot, which is why it sticks up some. I tried to force it in a bit, but did not push my luck because in a fight between the metal skirt and the plastic housing, my money is on the metal skirt; and I did not want to risk breaking a part of the Appendix which has become a rare commodity in the Saint Cloth Myth line. Another issue with the fit between the parts is that the skirt on the back of the figure falls off pretty much all the time. Although the appendix fixes many of the flaws of the figure, it does not fix the restrictions of the first Generation body.Which is why I am antsy to get the EX version. I got this figure a year ago as part of a large purchase, so I put him together and then shelved him with the rest of the Gold Saints. I feel a bit bad for not having spent more time with Scorpio Milo before, because the design of the armor really grew on me. So how will this release stack up to the upcoming EX version? Stayed tuned, as that is my next planned Saint Cloth Myth review. I can't wait to see some comparison shots when Scorpio EX comes out. Possibly even side by side Athena Exclamations?! I still really like this version of Milo though, and character wise he's in my top 4 Gold Saints. I completely agree. The original Myth Cloth were good for their time. But they have been overshadowed by the EX line. Even Gemini Saga, who I thought was the best of the Gold Saints in the original line was eclipsed by the EX version. Good job for review of the old stuff!!! Dari-oh- So true. I could have been cool to get an EX pope and throne with the EX Gemini. But if they did that, I am sure they would have charged more for it. Samurai Aveneger- Scorpio was a pretty early release. Though it is kind of bad looking, the 5 bronze saints are still the most funny looking in the line. I am not sure who did the sculpts for the appendixes. To be honest , I have not looked into who does the sculpts for the line. I am not even sure if that information is available in English.